This course will help participants gain a deeper understanding of executive functions and how executive functions deficits impact the behaviour and academic production of children and adolescents. 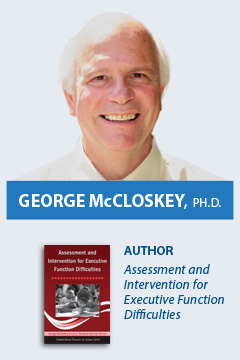 Participants will gain state-of-the-art knowledge of how to identify executive function strengths and weaknesses and the most effective ways to help children and adolescents improve their use of executive functions. Ways to discuss executive functions with children, parents and other school staff will be offered as well as ways to help motivate adolescents to ensure their full participation in efforts to help them. Special emphasis will be placed on how to orient students to intervention efforts and help them move from being externally controlled to internally self-regulated through the use of bridging strategies. Case study examples of assessment and intervention efforts and outcomes with children and adolescents will be discussed throughout the presentation. Participants will leave this workshop energized and with a renewed sense of purpose, a greater knowledge of how to improve executive functions, and a greater realization of how they can have a positive effect on the children, parents and professionals with whom they work. Traditional rooms for $199.00 plus tax a night. Fees do not include applicable taxes (13% HST). The early bird date has passed. Regular rates apply.